Ok, Tennessee. I’ve had about enough of your weather identity problems. Bring on spring already!! I swear my sons have had more cancelled soccer and flag football games than they’ve actually gotten to play. Bummer! One thing that always make me happy is… ranch. Since moving to a plant-based diet, I have really missed dipping any and everything in creamy fattening Ranch dressing. Good news is I’ve perfected a plant-based version of Ranch dressing and it’s coming soon to this blog! You know who else loves Ranch? My two boys. 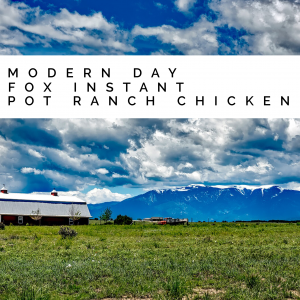 And thanks to them, I get to share with you a delicious Ranch chicken you can easily make in your Instant Pot. Here’s to clean plates and NO complaints! 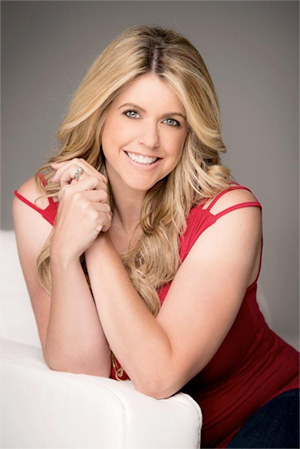 A quick reminder that my monthly challenges are still happening – if you are ready to change your health and fitness for once and all, send an email to moderndayfox at gmail.com and let’s get this party started!! Make this quick and flavorful weeknight favorite which is sure to please your Ranch-lovin' kiddos! 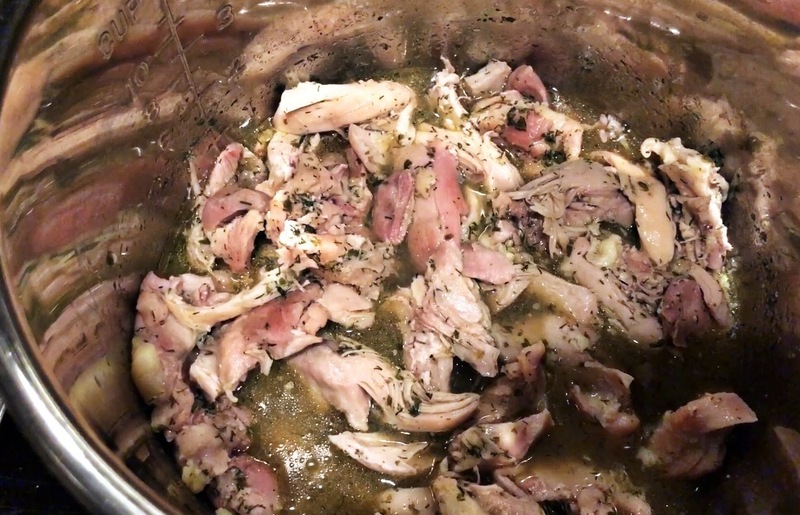 Remove lid from Instant Pot and place chicken in liner pot. If you are using chicken breasts instead of thighs, make sure to slice chicken into thinner pieces so that it cooks thoroughly. Big thick chicken breasts will undercook on the inside. Combine seasonings in a small bowl and stir until combined. Pour 1/2 cup broth into pot. Replace lid and turn valve to sealing. Set pot to 10 minutes manual high pressure. Use a quick release for the steam when the timer goes off. Stir chicken and shred with two forks. You may also opt not to shred but the seasonings distribute better if you do. Serve and enjoy! This dish is great over rice. You may even want to cook your rice using the ranch flavored broth! This last month was hard on me. Losing my best friend, Ted, to a pulmonary embolism just four weeks ago blind sided me like no other. It’s hard to grieve when you have little people to take care of and a household to run. You wonder how the world keeps turning when something so tragic happens, but somehow it does. You want to be mad about that, but it’s actually the thing that forces you to move forward. You literally have no choice. That’s why I’ve been absent from my blog for several weeks. I hope you understand! The good news is that Ted and I mutually shared a love for cooking (and eating) and so I believe I would do a real disservice to him to give up on my recipes and videos. Ted would look at me in his overly sarcastic way and say, “Really? ?” if I even considered that. So, I’m back! 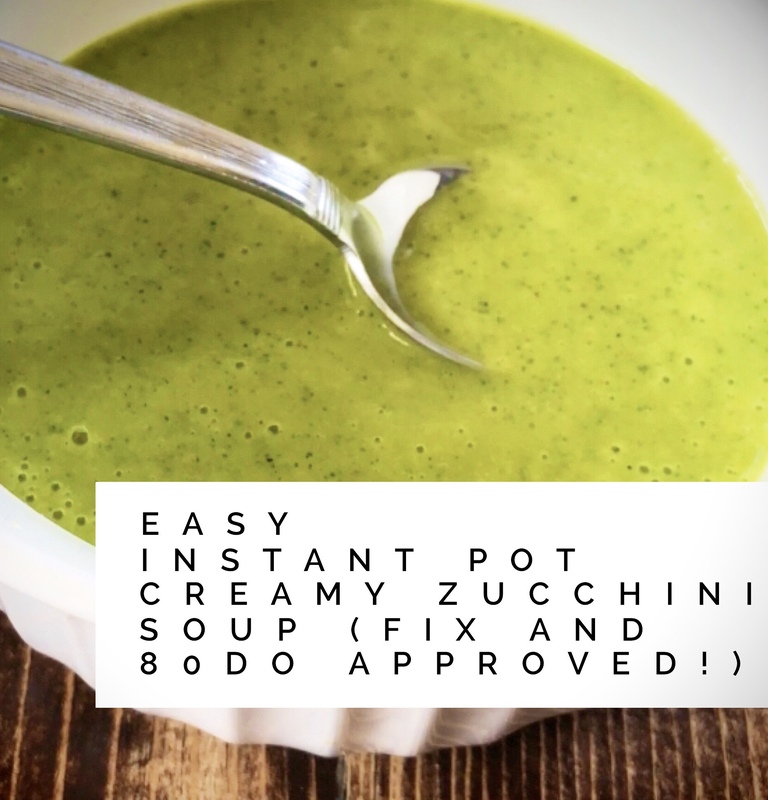 Today I have a 21 Day Fix and 80 Day Obsession approved Creamy Zucchini Soup that you can make in your Instant Pot with the help of your blender! I recommend doubling or even tripling this recipe if you are feeding a crew. I made this specifically for my meal prep and the serving size is only 1/2 cup which equals one green container and one blue container. This recipe makes 2 cups total so that’s four snacks for my meal prep for the week. We all know that your family will laugh at you if you give them a half cup of soup, so doubling the recipe may be best for you. This creamy zucchini soup is rich and velvety and oh-so-easy to make in your Instant Pot and blender! If you are following the Fix meal plan, a serving is 1/2 cup which is not a whole lot. You may consider doubling or tripling this recipe for larger serving size. This recipe as is makes two cups of soup! Wash and chop zucchini into large chunks, discarding ends. Place zucchini in steamer basket and then place inside Instant Pot liner pot. Add one cup water to bottom of Instant Pot liner pot. Replace Instant Pot lid and turn valve to sealing. 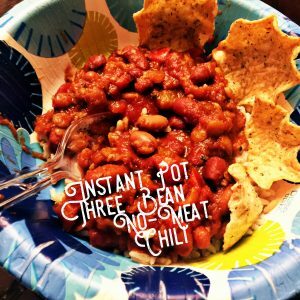 Set Instant Pot to Steam for 2 minutes. When timer goes off, quick release the pressure by turning valve. Allow zucchini to cool for a few minutes and then pour into blender. 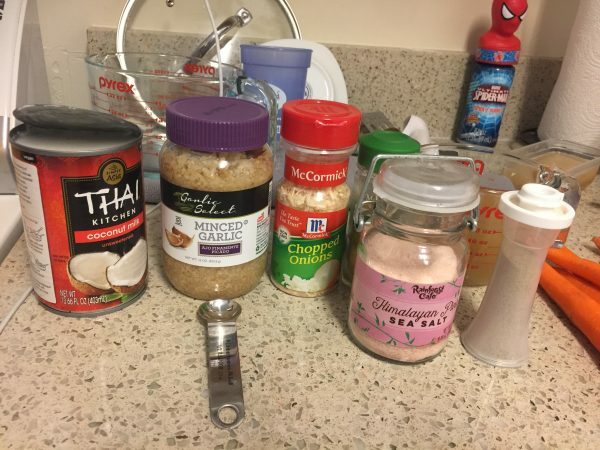 Add 1 cup coconut milk and all seasonings to the blender. 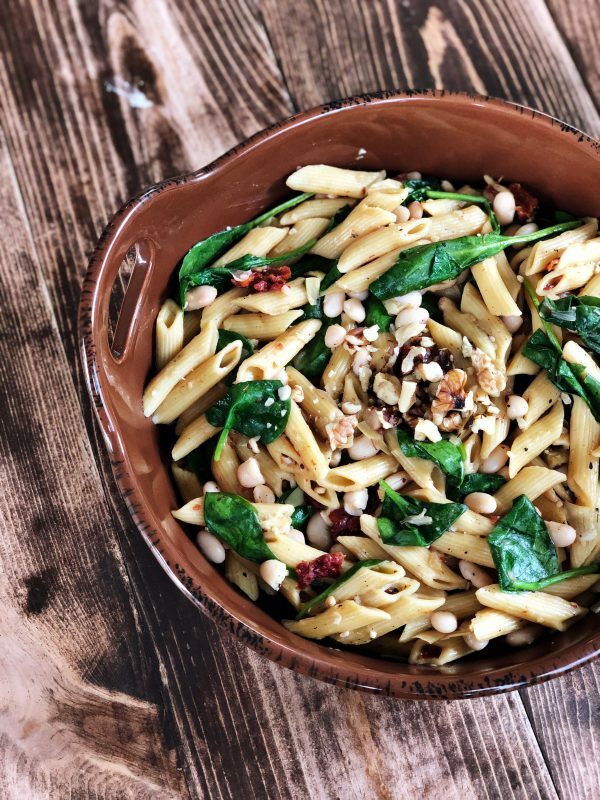 Pasta with white beans is a recipe has appeared on my menu a couple times over the last few weeks. I made the Red, White and Green Pasta from The Simple Vegan Cookbook and loved it. Then, my weekly order from My Veggie Chef had a very similar dish. Both times my family really liked it, so I knew I had to create my own recipe for the Instant Pot. I think I came up with something very special with this recipe! It is low in fat, vegetarian, and delicious! The sky is the limit on how you can improvise with this recipe. Add some chicken or sausage if you eat meat. Add some feta if you eat cheese. Add olives and pine nuts to make it even more Mediterranean. Switch out the spinach with argula or kale. You do you, and make this dish your own. I do recommend using the sun-dried tomatoes and artichokes that are soaked in oil. It gives the pasta great flavor! If you opt for ones that are not soaked, you may need tom compensate with additional spices. Remember, any change in the recipe that you make can affect the outcome. The directions are for white penne pasta. If you change the pasta, you may need to research to see how that changes cooking times. 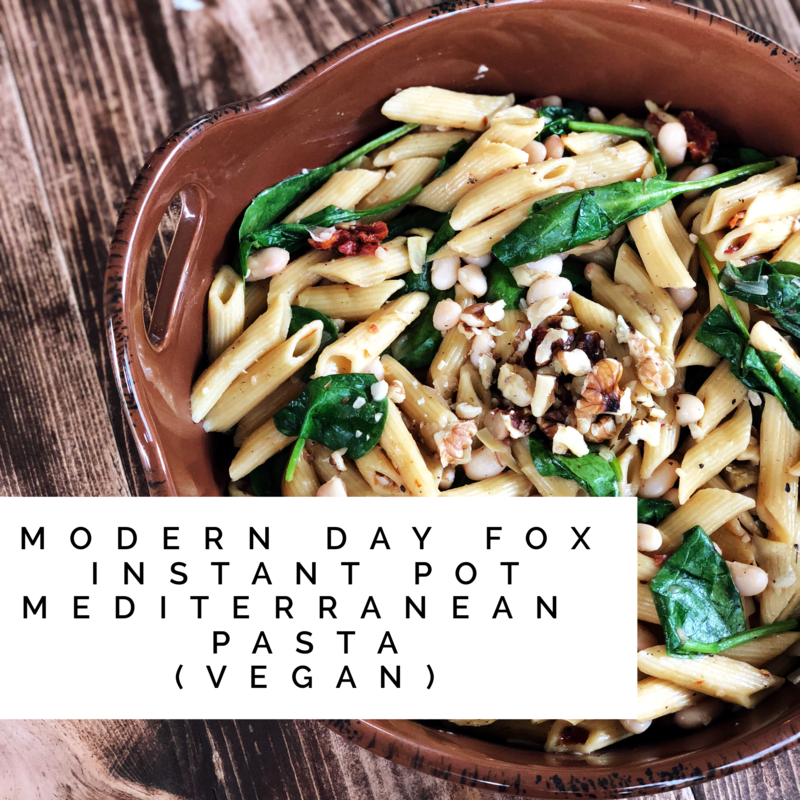 All the flavors of the Mediterranean in this healthy Instant Pot pasta dish! Add onions with a splash of water and saute for one minute. Add minced garlic and continue to saute. Add more water if it starts to stick. Add all spices and saute another minute. Add pasta and 4 cups water. Stir to combine onion mix with pasta and water. Add artichokes and sun-dried tomatoes on top, but do not stir. Replace lid on Instant Pot and turn valve to sealing. Set pot to 4 minutes manual high pressure. When the timer goes off, use a quick release to release pressure. When pressure is fully released, remove lid and stir thoroughly. Drain and rinse white beans. Stir into pasta. You may opt to top with feta cheese, pine nuts, olive or a squeeze of lemon. I had a yard sale yesterday and it was interesting to say the least. I personally love yard sale shopping, but it brings out some mighty strange characters. One guy ripped into the driveway with an overflowing truck full of junk. He looked like Uncle Fester and talked in a gruff voice like he had a mouth full of marbles. He handed me a plastic cup with a Taco Bell dog on the front and asked me for black coffee. “No coffee here,” I said. Then he proceeded to tell me how pretty my smile was and he would like to take me home. I told him I come with a husband. Then he went around and made a huge pile of stuff (including a box of nursing bras) and struck a deal with me. He said he would come back with the money. He didn’t, but he left his dog cup. Another young girl asked if she could just buy a whole tub of baby clothes for $25. I told her I wasn’t ready to sell it like that, but if she came back at two pm I might be feeling generous. She came back and by that time all the clothes were mixed up in the various tubs. I told her she could go through them and make a big pile of items she wanted. As she worked on her pile, she told her friend she didn’t want coats, anything over 12 months, and nothing stained. She made a pile and asked me how much. I said, “$20?” (There were 38 pieces of clothing.) She said, “Well, I thought I was gonna come back here and grab a tub for $25.” I said, “Well you can add more clothes if you’d like to your pile and pay $25.” She was really stuck on grabbing a tub. I asked why she would want to grab a tub of mixed up clothes when I’m letting her pick the pieces she wants. Again, I told her she could add more clothes to her pile and still pay just $20. She said, “But I only brought $11.” Um, ok. “Alright, you can have that pile you picked out for $11 then.” She said, “But I thought I’d be getting a tub full,” she said. I replied, “I’m trying to follow your logic. You wanted to grab one of these tubs ‘as is’ and pay $25, but you only brought $11. And now, I’m letting you pick the clothes you actually want instead of a tub full of junk and agreeing to accept $11, and you clearly aren’t happy. 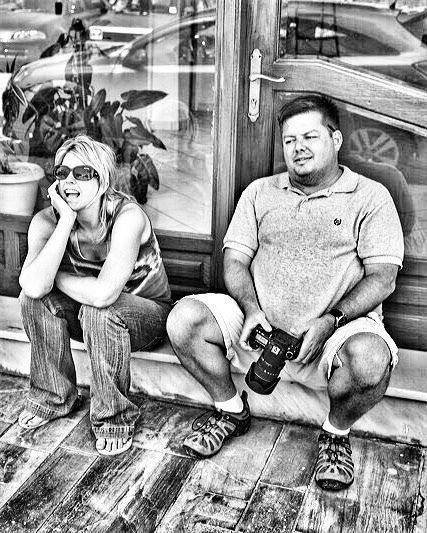 What do you want exactly?” She said, “I don’t know. I just thought you said you’d be feeling generous, so I would get a tub.” She was pretty ticked off, but she gave me the $11 and took the clothes that I let her hand pick. Her friend later came back to buy something and told me that she was upset because she felt I misled her. I am still mystified by the whole thing. I truly thought I was being generous by letting her hand pick the clothes she wanted rather than take a random tub of mixed up sizes and conditions. Anyway, I do understand that money is hard to part with, especially when you only have a little. 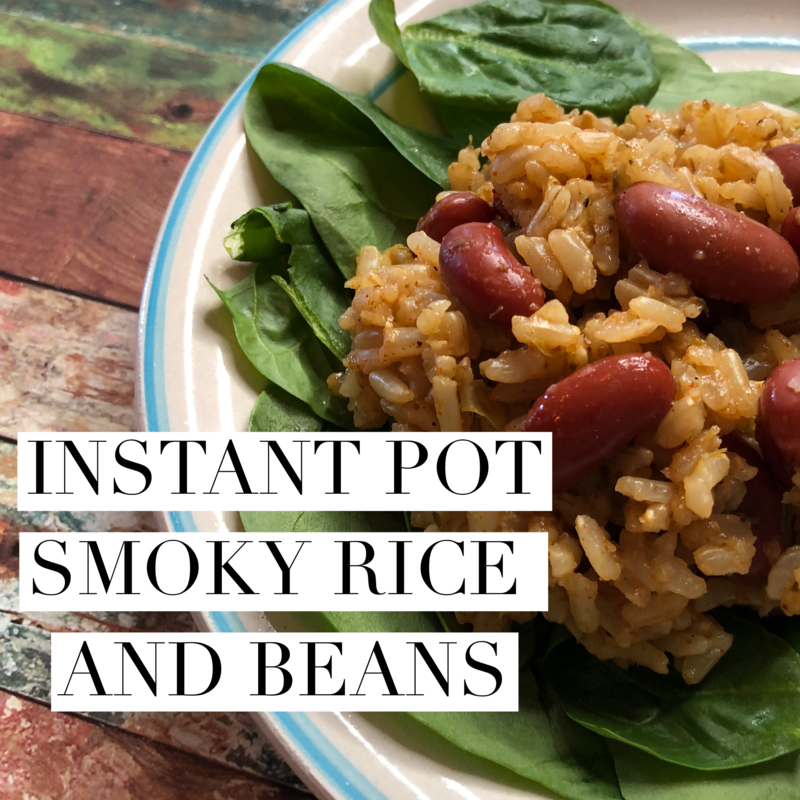 For that reason, I’m sharing a cheap and easy Instant Pot recipe that is tasty and versatile. You can add hot sauce, top it with chicken or smoked sausage, or roll it up in a burrito. It will makes several meals, and stretch your hard earned dollar so that you can buy more at your next yard sale. Cheap, fast and easy! This smoky dish can be paired with smoked sausage or chicken, rolled into a burrito, or eaten as it! In a small bowl, combine seasoning mix and set aside. Set pot to Saute and allow to heat. Add 1/4 cup of water and garlic. Saute for 30-45 seconds. Add green pepper and onion. Saute for 3-4 minutes until onion is translucent. Add seasoning mix and saute for one minute, stirring constantly so it doesn’t burn. Add brown rice and stir well to combine with vegetables. Add broth and make sure rice is completely submerged. Replace lid on Instant Pot and set vale to Sealing. When the timers goes off, allow ten minute natural release. Release any remaining pressure and remove lid. Drain and rinse kidney beans. Stir into hot rice. Add additional salt, hot sauce and/or seasoning to taste preference, if desired. I feel like a lot of people psych themselves out by making food prep way too complicated. There is a saying called KISS that I love and follow: “Keep It Simple, Stupid!” Especially when you are new to meal planning, you don’t have to pretend you are a master chef and cook things that have a 100 different ingredients and take 3 hours. Choose recipes that are easy and quick, and that have enough servings to make multiple meals. I have many people in my monthly fitness challenge group that are doing the 21 Day Fix and searching for easy ways to use their containers. I came up with this simple Instant Pot prep that makes at least four meals with chicken leftover for other meals. I suggest serving the chicken and black bean salad over two cups of chopped romaine lettuce with a 1/4 avocado. If you are using the container system, that would calculate to a red, yellow, 2 greens, and a blue container. Not only is it low fat, low calorie, and delicious, but it all comes together in roughly 15 minutes including the time your Instant Pot needs to come to pressure! Check out this video to see the prep in action! Make sure to subscribe to my youtube channel too! 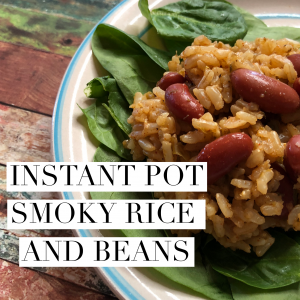 A quick and easy Instant Pot food prep that is low fat and low in calories! You can jazz it up with cilantro, jalapeño, onions, extra spice... make it your own! Mix all spices in a small bowl. Place chicken breast into Instant Pot. You may want to slice your chicken length-wise in half if your breast is extra thick. Pour spices over chicken. Flip chicken to help spread out spices. Replace lid and set pot to manual high pressure for 7 minutes. When timers goes off, use a quick release. Turn Pot off. Remove chicken and place onto a cutting board. Shred with two forks. If by chance the center of your breast is slightly undercooked, set pot to Saute and pour shredded chicken back in to cook for a few more minutes. 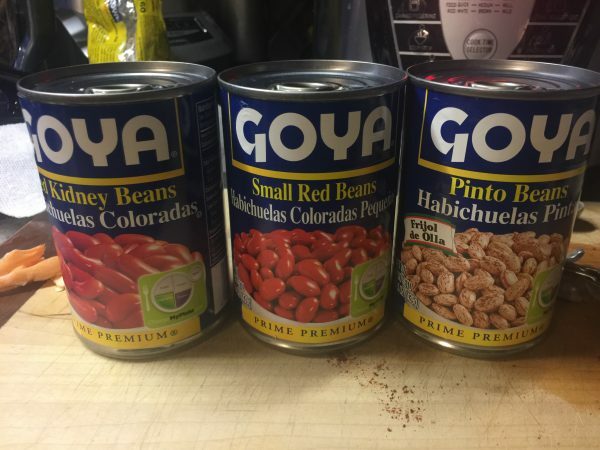 To make black bean salad, drain and rinse black beans. Stir quartered tomatoes and frozen corn into black beans. Add juice of one lime, cumin, salt, and pepper to black bean salad and stir well. As a serving suggestion, serve black bean salad and chicken over romaine lettuce. I know why Northerners laugh at Southerners when it comes to weather. I know because I was a Northerner for the first 22 years of my life, but I’ve been a Southerner for the last 19. I remember opening the front door when I was in high school and seeing the snow over waist high. I believe it was the Blizzard of ’93 in Maryland. We were holed up in our house for days with good reason. But now, I live in Tennessee and we too are currently holed up in our home because of less than 1.5″ of snow. My kids haven’t been to school since last Thursday. They cancelled school on Friday because it was supposed to snow. It didn’t. Today is Tuesday and we did have a good snowfall today. School is already cancelled for tomorrow. My husband has bets that it will also be closed on Thursday. What to do? For me, I cook. And cook, and cook, and cook. 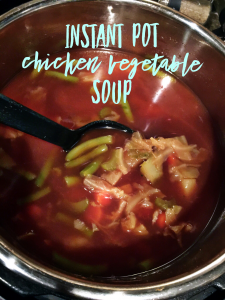 I whipped together a comforting chicken vegetable soup in my Instant Pot using what I had on hand – because you know I couldn’t get to the store. Best part was that both kids really loved it, and I loved seeing them actually eat their veggies! One little note – you can definitely use fresh chicken. If you do, put the chicken in your soup in the IP for 10 minutes and then release. Remove chicken and chop. Add back to the pot and then cook for another 5 minutes high pressure with a quick release. If your chicken is frozen, then set the IP for 15 minutes instead of 10. Chop and return to the pot for another 5 min high pressure with a quick release. This post contains Amazon affiliate links which help to directly support the life of this blog. When you use my links for purchases, you help keep Modern Day Fox alive! Thank you! Replace lid, and set pot to manual high pressure for 20 minutes. When timer goes off, use a quick release. Stir in one can of drained green beans. Add additional salt and pepper, if desired. Serve and enjoy! 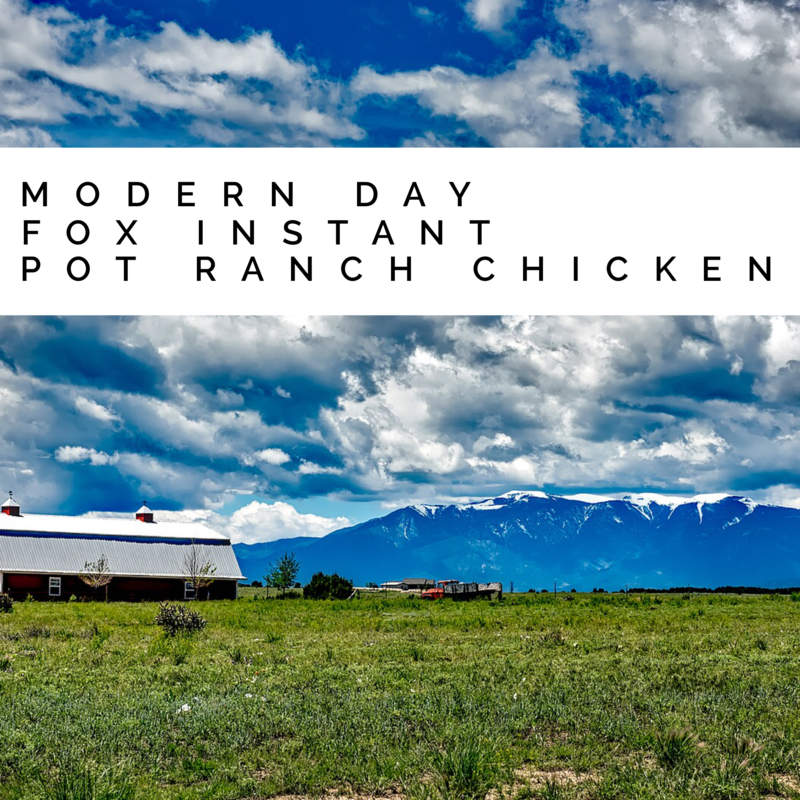 The next few recipes I will be posting on Modern Day Fox were designed specifically for a prep that I created for a friend in need. I have been six weeks meat and dairy free, and focused on a whole food, plant based diet. I’m feeling great, but I have to admit that I miss cooking meat in my Instant Pot even more so than eating it. How crazy is that? What can I say? I just love experimenting with my IP. When my friend, Cassie, asked if I would help with some freezer meal prepping for her to use post-surgery, I jumped at the chance. Not only would this allow me to be of service to a friend, but I would also be able to whip up some fun meat-based recipes to share with you. 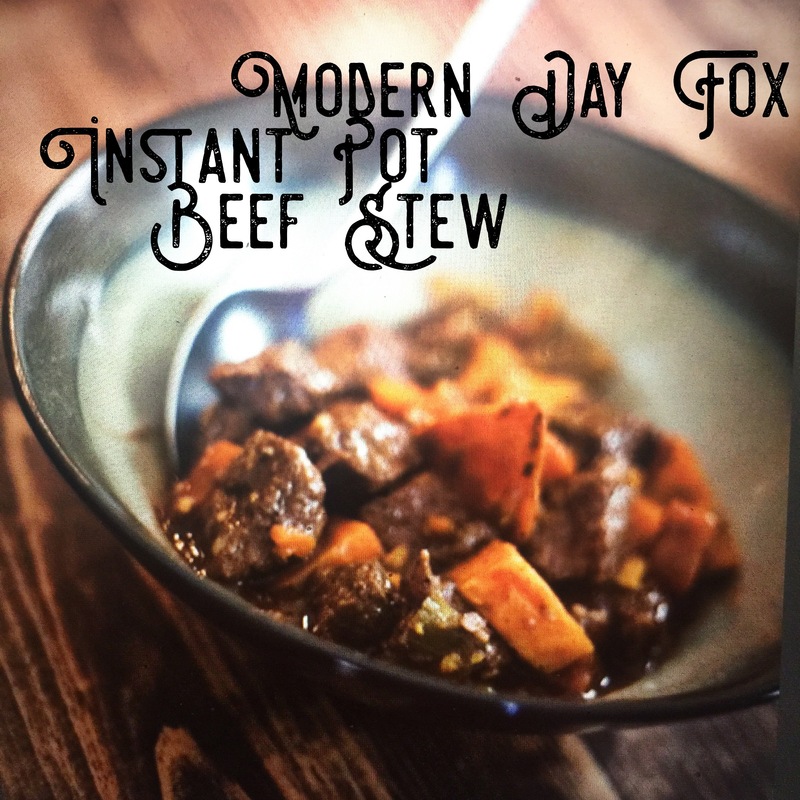 There are many Beef Stew recipes out there, but mine was probably most heavily influenced by this one at Budget Bytes. I prefer a specific mix of vegetables though – always gotta have potatoes, onion, carrots, and celery in my stew. I also do not love worchestershire or thyme flavors in my stew. I love to add red wine in my beef recipes as that added layer deepens the flavor. Finally, an arrowroot slurry gives it the perfect stew texture. I hope you enjoy my version of this American classic! Nothing says comfort food like a warm, hearty beef stew. This dish freezes and reheats well, and the flavors are sure to please your whole crew. Turn on Instant Pot using Saute Setting. Put flour in a medium size bowl and toss stew meat in it until well coated. Place butter in pot and allow to melt. Add stew meat to pot and brown. Stir occasionally so the flour doesn’t burn. When meat is browned, add red wine and deglaze the pot. Add broth, soy sauce, coconut sugar, garlic, tomato paste, rosemary, black pepper, and all the vegetables. Stir well. Replace lid on pot, and set to manual high pressure for 45 minutes. When the knob drops, remove lid and stir. In a small bowl, add cold water. Stir arrowroot flour into the cold water creating a slurry. Pour slurry into pot, and stir well. Set pot to sauce, and allow to thicken for a few minutes. Once thickened, taste and add additional salt, if desired. I’m just over one month eating a Whole Food Plant Based diet, and I’m loving it! I have lost six lbs already and I feel great. I’ve put aside counting calories and containers, and I’m just focused on eating unprocessed whole foods. After a year and a half of primarily eating a Paleo diet, I never thought I’d be able to cut meat out of my diet. Truthfully, I’m not missing it at all! On Jan 8th, my next fitness challenge begins and I’m pumped. I took it easy with exercise while I transitioned to this way of eating in December, just mostly doing Yoga and Pilates. But now, I’m ready to hit it hard with Autumn Calabrese’s new program 80 Day Obsession. Hit me up on Facebook if you want to join me! On of the day I’m writing this blog entry, it is New Year’s Day 2018. I attended a New Year’s Eve party last night. 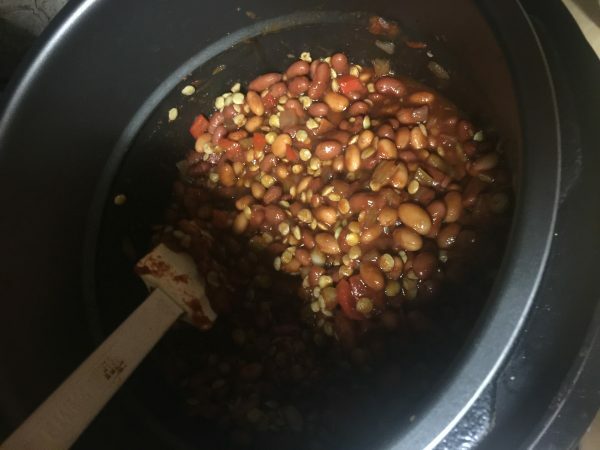 Instead of worrying about what I was going to eat and setting myself up for failure, I decided to whip up a delicious three bean chili in my pressure cooker. I also made a huge container of brown rice and brought whole grain tortilla chips and salsa. I was happily noshing all evening, and everyone enjoyed what I brought as well. I found most people were amazed that it was “Vegan.” Many people automatically assumed “vegan” or “whole food plant based” means tasteless, and nothing could be further from the truth. 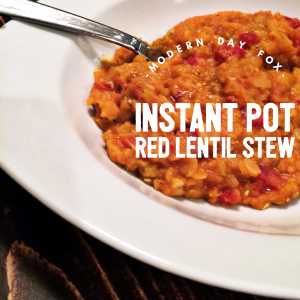 This Instant Pot recipe is adapted from one I found on Clean Food Dirty Girl. Check out the inspiration recipe here, but be beware that the blogger uses colorful language. If that bothers you, then just quickly scroll to the bottom of her post for the recipe. 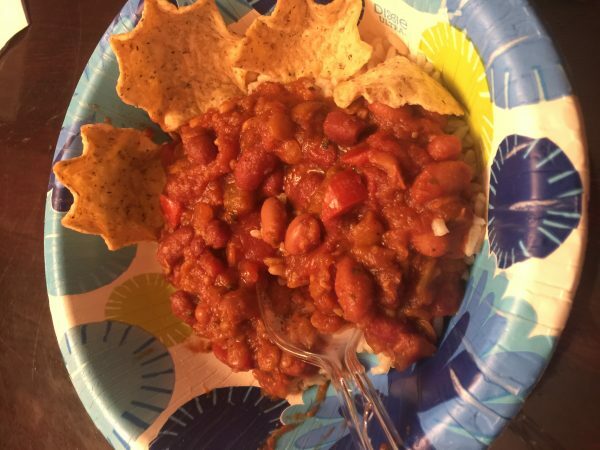 I hope you enjoy my version of this meatless chili. Feel free to add your own tweaks and spice it up with cayenne pepper or hot sauce! It’s sure to please all your meat-lovin’ friends! This post contains affiliate links that help to directly support the life of this blog. When you use my links to purchase, you are supporting Modern Day Fox! All opinions are my own. This recipe is adapted from one I found on the awesome WFPB blog, Clean Food Dirty Girl (see post for link). I tweaked it out and made a chili that was a bit more robust for a football lovin' crowd! Feel free to spice it up with cayenne pepper or hot sauce! NOTE: If you opt not to use lentils, you can decrease cooking time in your pot to 10 minutes high pressure. Soak lentils in water for at least an hour, then rinse well. Drain and rinse beans, and set aside. 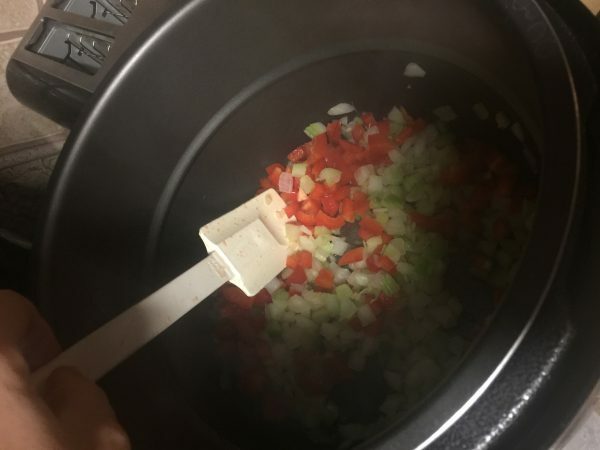 When pot heats up, add onion, celery, pepper, and minced garlic. Add all spices and stir well. Add beans and lentils and stir well. Add soy sauce and tomato paste and stir well. Add two cans of diced tomatoes on top, but do NOT stir. This helps prevent burning. Add water, but do not stir. Replace lid and set vent to Sealing. Set pot to Manual High Pressure for 30 min, or press Soup preset. 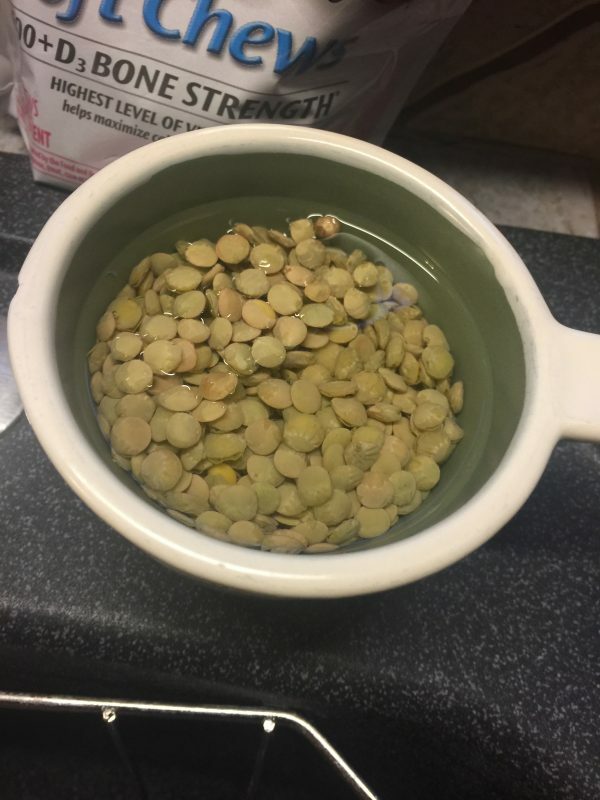 If you are not using lentils, set the pot to 10 minutes instead. When timer goes off, use a quick release for pressure. Never have I cooked a lentil until this past weekend. 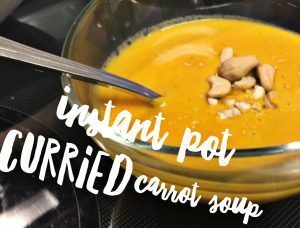 I did it in my Instant Pot of course! In my quest to find some more plant based recipes, I was watching a bunch of videos and reading recipes about Lentil Chili. But, listen folks. I am SO sick of Mexican dishes. It seems like every whole 30 or healthy recipe is seasoned with cumin and chili powder. I need a break from that. I threw caution to the wind and just winged this recipe. It turned out so tasty! Lentils, though – they kind of look like mush so prepare yourself. And, they overcook quickly. I saw some recipes online that had red lentils cooking for like 20 minutes! I imagine they would completely dissolve. 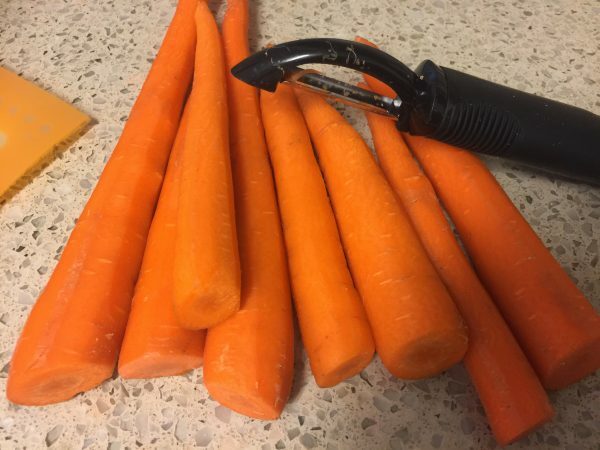 I chose a cooking time in my Instant Pot that left them just slightly firm. Try not to forget to do the quick release as you want these to stop cooking quickly. There are so many different ways you can eat these through the week. Eat them as a stew. Scoop them over some fresh steamed broccoli or over a baked potato for a carb-heavy meal. Put them as a side with your favorite meat. 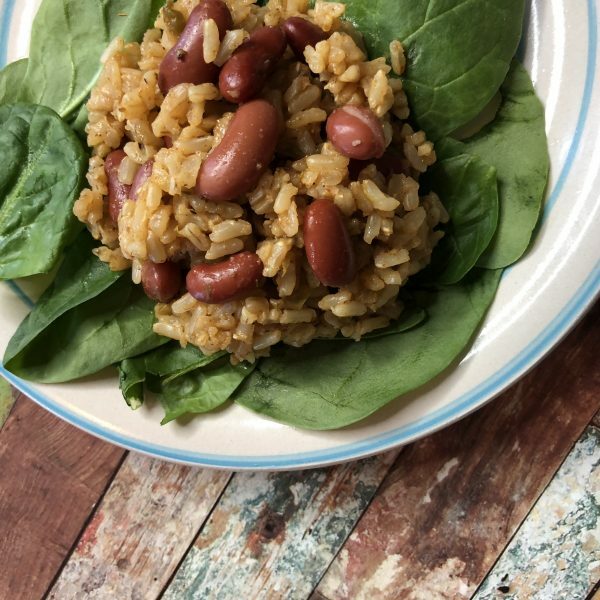 It is such a hearty dish that it will keep great through the week after you meal prep. I hate coconut. Can I sub the oil and coconut milk? Yes. Use olive oil or avocado oil instead of coconut oil. If you are subbing the canned coconut milk, use heavy cream. However, and this is important, add the heavy cream AFTER cooking is complete. Dairy products can sometimes curdle. These substitutions obviously change the overall flavor of this recipe, but it should still be tasty! This rich, hearty stew will warm you up on a cold winter's day! There is nothing better than filling your tummy with something so healthy and delicious. Add in onions and garlic. Saute for 3-4 minutes. Add in tomatoes and stir. Rinse lentils well in a mesh colander. Set pot to 6 min HP. When timer goes off, use quick release to release steam. Make sure to release steam immediately as lentils overcook quickly. Remove lid and stir well. Taste and add more salt, if needed. That’s what I said when my best friend, Kelley, suggested we throw together an Instant Pot soup for my blog. But, the more I thought about it, the more I liked the idea of disguising a serving of vegetables into a smooth soup. Make it tasty enough and no one in my family would know they were eating a full serving of veggies. Heck, I hardly noticed myself! Both Kelley and I deal with food intolerances in our households, so we immediately knew we would make it gluten and dairy-free. We strive to create dishes that are easy, and that meet the needs of our loved ones too. Our end result was a rich, almost buttery-tasting soup that was a cinch to throw together. Even my six year old wolfed down a bowl, and that says something – trust me! We hope you enjoy it too! Note: This post contains affiliate links that directly help support the life of this blog. When you use my links for purchase, you help keep Modern Day Fox going! I’m not sponsored by any company, and anything I recommend in this post I have actually purchased myself. 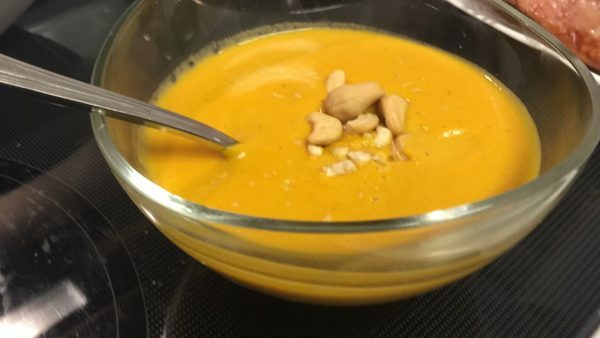 A rich and velvety carrot-based soup. Paleo friendly, gluten and dairy-free! Soak cashews in 1/2 cup water for at least 30 minutes. Drain water from cashews after soaking. 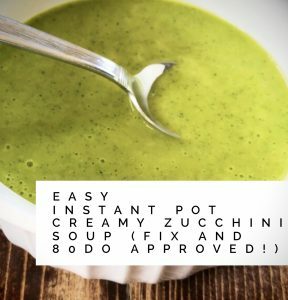 Place all ingredients into Instant Pot and stir. Set pot to 15 minutes Manual High Pressure. Use a quick release to release pressure when timer goes off. Allow to cool for a few minutes, and then transfer ingredients into blender. Pour into serving bowls. Garnish with chopped cashews and cilantro, if desired. Hi I'm Jaime. Modern Day Fox is a place where we celebrate the multi-passionate people in this world who are making it happen. This is also a place for me to create content around the topics I am personally most passionate about – personal development, photography, fitness, food, image, and music. This is a space to inspire and to be inspired. It's a classroom to teach and to learn. It's a table to share and explore. Together, let's learn how to "outfox them all!" Introducing 2B Mindset – A Complete Mind Shift!